Excel G5 'Modular' Hemi distinguished by the super-reduced frame, toddle's the main thing. 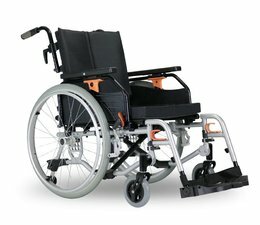 Besides the standard features that are available with the G5 Modular, the Hemi allows a single leg amputee or single leg paralysis to be able to propel the chair using their working limb. Excel G5 'Modular' Hemi is a member of the Excel 'Modular' family and therefore it includes a large number of components that are interchangeable within both the 'Modular' family as the first generation G4 and G5. User Weight: Max. 130 kg at seat width 35, 37½, 40, 42½, 45 and 47½ cm. 150 kg at seat width 50 cm.